Product prices and availability are accurate as of 2019-04-21 17:31:19 UTC and are subject to change. Any price and availability information displayed on http://www.amazon.com/ at the time of purchase will apply to the purchase of this product. 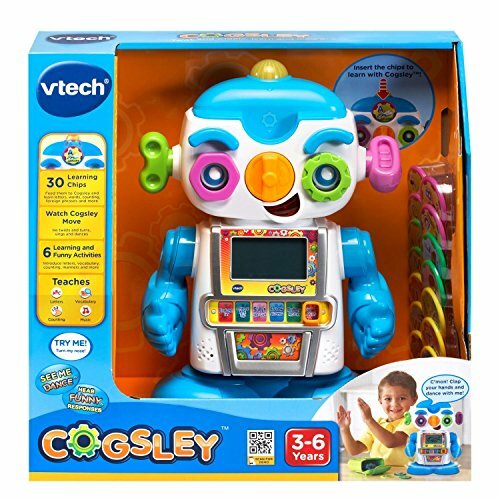 Now you are looking at VTech Cogsley Learning Robot which is one of our many available items from the make V Tech. Choose this product right now or search through our site for other like choices. 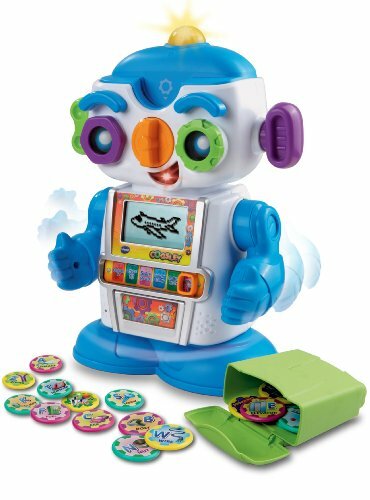 Cogsley by VTech is the perfect learning robot friend for your child! With his quirky personality, rockin' dance moves, and funny responses, your child will love interacting with him as they learn about letters, counting, words, manners, and more! 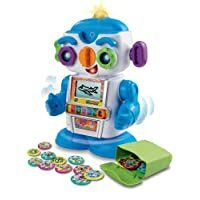 This electronic learning toy robot comes with 36 computer chips that trigger fun animations on his LCD screen when they are inserted in the slot above his nose. 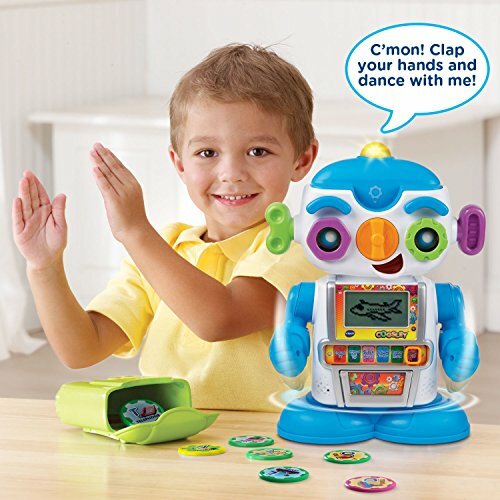 Your child can even get a reaction from this learning robot by singing to him or clapping their hands! With six different ways to play, your child will have fun for hours as they hang out with their new pal. Twist and giggle your way to learning fun with Cogsley by VTech. Cogsley is the perfect learning robot friend for kids 36 months and up. With his quirky personality, rockin’ dance moves, and funny responses, your child will love interacting with him. Cogsley will help them learn about letters, counting, words, manners, and more. 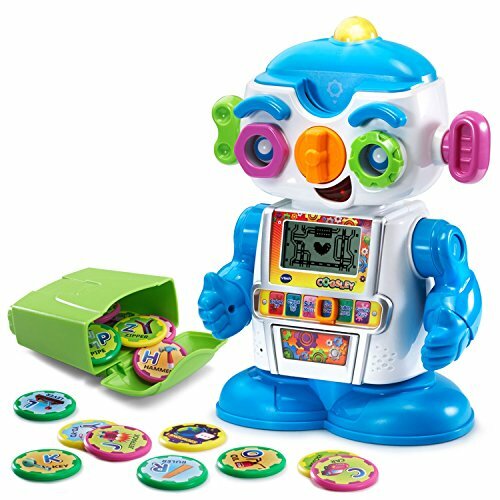 Cogsley comes with 30 computer chips (round plastic tokens with letters, words, and pictures) which trigger a variety of responses including movements, sounds, images, and fun animations on his LCD screen. Cogsley’s sound detector is activated by clapping, talking, and singing. Your child will enjoy getting a reaction from this learning robot by singing to him or clapping their hands. Cogsley is full of personality and movements which include twistable ears, spinning nose and eyes, moving arms, twisting body, and moving eyebrows and mouth. With six different ways to play, your child will have fun for hours as they hang out with their new pal. Cogsley is packed with parent friendly features. An automatic shut-off preserves battery life, allowing for hours of kid friendly fun. Cogsley's backpack easily stores his learning chips, making cleanup even easier. Cogsley was built with your child’s development in mind. 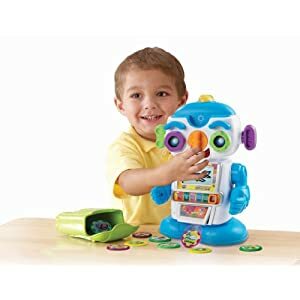 The robot's quirky personality and fun movements contribute to an imaginative play experience. Clapping and singing at Cogsley and feeding him certain chips cause him to react with specific responses and sounds demonstrating cause and effect. Inserting the learning chips and turning the robot's gears help build hand/eye coordination.